Stepping firmly into their 40th year of entertaining audiences with impressively imaginative puppetry, the Puppetmongers have remounted their very first production of The Miller and His Wife for a special spring break run at Theatre Passe Muraille’s Backspace. Full of whimsy for the little ones, pop-culture interjections for the slightly older ones and chuckle-worthy dry humour for the adults, it’s a refreshingly nostalgic reminder of just how magical theatre can be. The Miller and His Wife is actually two stories, based on a couple of European folktales, rolled into one 60-minute performance by the brother and sister team of puppeteers Ann and David Powell. The first is about a clever Miller who outsmarts his oppressive landlord in order to provide for his family, and the second is about the Miller’s wife, who saves a king by intervening in a dastardly assassination plot all thanks to her mad baking skills. The Powell’s work with 19 puppets in this production and each is afforded its own personality and voice, which is both fun and enthralling to watch. While last night’s audience was only comprised of three kids amongst mostly adults, my periodic glances in their direction had me believing that they were enjoying the show as much as I was. Dressed to match the backdrop, Ann and David are just as much a part of the performance as their puppets, functioning as the narrators, commentators and occasionally scenery and props. Their cast of puppets are the free-standing kind, which requires them to maneuver quickly between each character as the stories progress. I was most enthralled at the intricate movements each character was able to make, partially due to the way the puppets were designed and partially due to the deft hand of the puppeteers. It’s a wonder to see the comfort that Ann and David have in performing this show, as it’s been in their repertoire for so long they know just when and how to play around with the story. I think kids will be attracted to the timelessness of the tales, the enthusiasm of the puppeteers and the magic of the Powell’s craft. I think adults will enjoy the little details of the puppets themselves and chuckle along with all the self-referential moments. 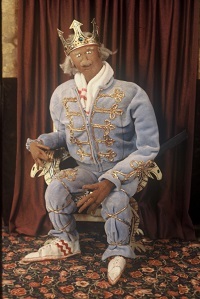 The Puppetmongers are wisely doing matinee shows throughout the week of spring break as well as evening performances, and I think it might be worth an hour of unplugging yourself and the kids from the every day to spend some time with The Miller and His Wife.